When Billy was born, he had a severe clubfoot with a very tight heel cord. Here are pictures of his foot after a couple of months of stretching and taping but before the correction surgery. I wish I had taken pictures of his foot when he was born, but I was very busy taking care of his other issues and didn't think of it. As you can see, the foot points downward at the ankle, and the forefoot and toes point inward and downward. His heel cord is very tight, making his foot look like a ballerina's. The first picture is of his foot during the strapping process, in which they used tape to try and pull the foot into a better position, instead of casting it due to concerns over whether he would feel a cast rubbing his skin. The second picture is after strapping with his AFO off. 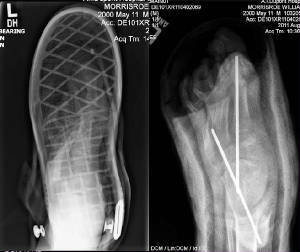 Also, I've included the pre-surgery xrays of his foot at a year of age, after strapping was done from 2-5 months of age and he wore an AFO from 5 months old till the surgery to hold the forefoot correction they had gained. Without AFO at about 9 months of age. 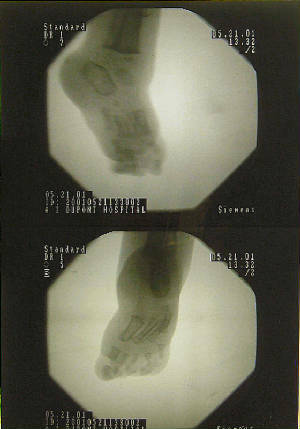 Here is a picture of Billy's foot after the correction surgery. The surgeon did a wonderful job straightening out his foot. He still has to wear an AFO (Ankle/Foot Orthosis) to help stabilize his ankle and foot since he is missing some muscles and tendons in that area, and also to help keep his foot from turning back inward. Two weeks after the cast came off from this surgery, Billy took his first steps, and now there is no stopping him! His ankle is pretty much fused, but he can still get around fine. He also has a lift in his shoe to even out the leg length discrepancy and to help balance things out. It has been almost two years since Billy's foot surgery. The foot is still nice and flat, although he has to wear his AFO all the time to keep it from turning back inward. This is good, since the AFO also stabilizes and protects his fused ankle, and allows him to wear the same size shoe on both feet, even though there is a three size difference between them. As you may be able to see, his last two toes have curled more since immediately post op, but don't seem to bother him. His left leg isn't growing as fast as the right, and as of now, he has a three centimeter lift in the sole of his shoe to help even out the discrepancy. At some point, he will need his left leg surgically lengthened. Despite all that is unique about his left leg, he has learned to run, climb, and even to jump, to our surprise! Now, over six years from the original surgery to straighten out Billy's foot, we are starting to have concerns again. The doctor had told us originally that there were fused bones in the outer middle part of Billy's foot after the surgery. He said that these would not grow correctly, and that Billy would probably need corrective surgery on that by preschool age. Due to the muscle imbalances in his foot wanting to pull his foot back into a clubbed position during growth, Billy has needed to keep wearing the AFO - it was originally only supposed to be for the first three months after the surgery, but taking it off resulted in the foot starting to curl again. Because of this, I think it's helped somewhat with the fused bones, at least buying us some time. Now at seven years old, you can see the area where the bones are fused, and that area is causing his foot to bend up there, instead of laying flat. Now, when he stands on that foot, only the outer edge of the foot and the outer front part actually touch the floor most of the time. He doesn't put his heel down, since that hurts his knee, probably from the malformed tendon behind his foot being too tight. The orthotics department changed his brace to add a "heel" so he can have his foot at less than ninety degrees, while still being "flat" for walking, and he is more comfortable now. You can see the added heel above is the darker red color. We did a gait analysis to see if it is time to fix the foot and perhaps the tibial torsion (his lower leg has twisted outward so that the foot and knee no longer are aligned) and/or femoral torsion (hip is connected to spine in an outward position, and leg is already not aligned forward). We are waiting for the results of that still. 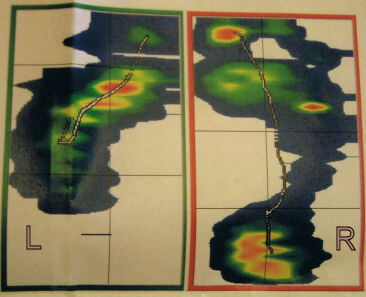 We got the results of the gait analysis back. The new brace and shoelift are doing their job well, greatly improving Billy's gait while they are worn. This should help protect his joints from unnecessary damage, and he will probably need an orthotic on the left leg even after he is done growing to help his gait. At some point after his full growth, he should be able to switch to a leafspring AFO to help protect from foot drop and give more pushoff with his step. 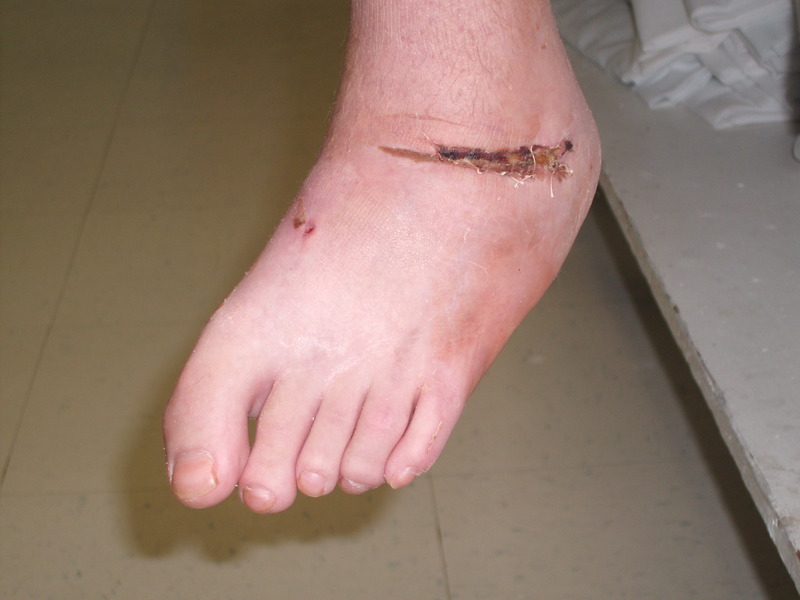 August 2008 update - we saw the ortho last month, and he said that as long as the orthotics department can make a brace to help Billy out, we can hold off surgery for the foot, which is still worsening, but that their ability to brace it would determine when surgery needed to happen. I just picked up the brace yesterday, and it's way different than the previous one. That one only had a 1cm heel lift while this one is closer to 2.5cm. His foot no longer can bend as far at the ankle to get it flat. His heel in the brace is actually OUT of the shoe, but the extra material of the brace allows the shoe to grip it tightly and that doesn't cause any problems, as odd as it is. I'm not sure if that whole 1.5cm added to the heel is a total change in the foot or if they just wanted extra padding in there for Billy's comfort but the orthotics guy there said this was probably the last brace they could do and next time we'd be looking at surgery to flatten the foot back out. We had wanted to hold it off until we were ready for leg lengthening, but I don't think that's gonna happen. Oh well, we'll just have to see what happens. Billy says the new brace is comfortable, and the good news is that they were able to shave 2cm off of his shoe lift, so now it's only 1.5cm in height and practically unnoticeable compared to his old lift! Things have been stable enough with Billy's foot... it has warped a bit more and his leg length discrepancy has grown a bit, but the creative people at the orthotics department have continued to work their miracles and hold off surgery. Our hope is to wait until we do the leg lengthening at around age 13, and straighten the foot out at the same time. Well, ten years after surgery, and about five years of creative bracing, we've run out of options to try to hold off foot reconstruction surgery. Billy can no longer walk or bear weight comfortably in his brace and shoelift, despite adding height to the brace heel to accomodate the fixed downward angle of his ankle and instep padding to try and cushion his twisted foot. Xrays in the brace from the outside side view almost look like from the top or bottom, since you can see all the long bones in his midfoot due to the foot twisting sideways. He will have major surgery to reconstruct the ankle and foot to make them able to be level on the floor at a nornmal 90 degree angle. If this is anything like the original surgery at one year old, he'll be off his feet and non-weight bearing for six weeks following surgery then maybe back into a new AFO to try and hold the corrected position? I know they said he'd probably wear some kind of AFO for life just to try and help correct his gait and protect his hip and knee from damage, plus I assume we're still going to have to fight more downward pull on the foot due to muscle imbalance from missing all the muscles on the top of the foot. Fingers crossed all goes well! It will be interesting, since his leg length discrepancy has also increased again this year (after being quiet for about five years) and we're probably at about the 6cm mark. It's hard to tell since Billy's foot is so flexed but after foot surgery, that will change and we will be back to the full lift being on the sole of the shoe, instead of part of it being in the AFO. Well, the surgery itself went very well, it was fast and easy, and went exactly as planned. We stayed overnight in the hospital and then went home the next evening. Once we got the pain meds adjusted to the best dose to keep Billy comfortable, he adjusted well to life in a cast and was pretty much unfazed by the whole experience. Those first five or six weeks were probably the "easier" part. At five weeks post op, the cast came off and the pins were taken out. It was fairly uneventful, and then we went and got molded for a new AFO brace, then recasted for the next week while the AFO was made. 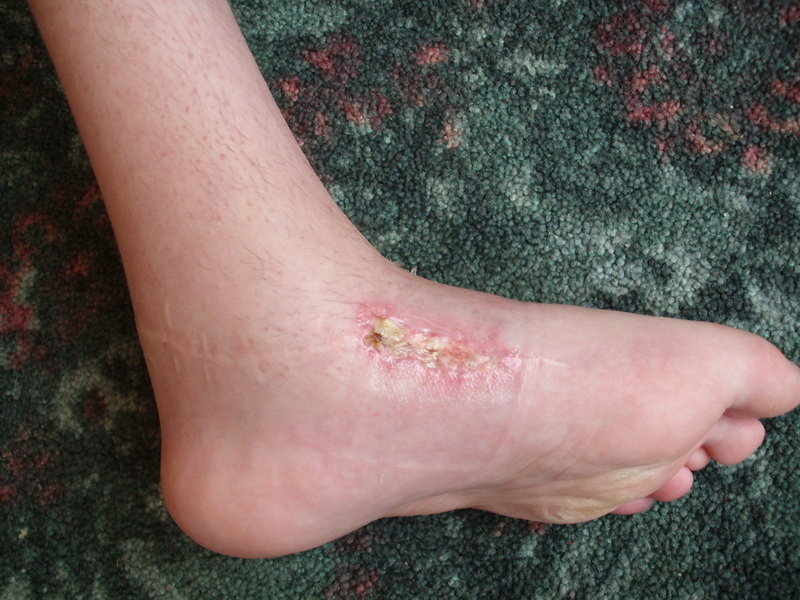 However, the next week, when we took off the cast, the incision site on his inner side of his foot looked AWFUL. It was gooey, yellow and wide open looking. We were instructed to put bacitracin on it and bandage it up while it healed. However, doing this did NOT make it get better, even if it did get less yellow. It didn't technically look "infected" but it didn't look good or close up while covered. Finally, I took the bandages off, and gave the wound as much air as possible. This eventually scabbed it over, but any time we put a sock and his AFO/shoe on it would get gooey again. We pretty much gave up on shoes and walking (it hurt him to walk unsupported without his AFO and shoe) until we could get the wound to heal completely. Billy started the school year in a wheelchair, with his foot covered with a sock for hygiene and asthetic reasons. Finally, around 9 weeks postop, the wound decided to stay scabbed with his AFO and shoe on, and we started making progress. 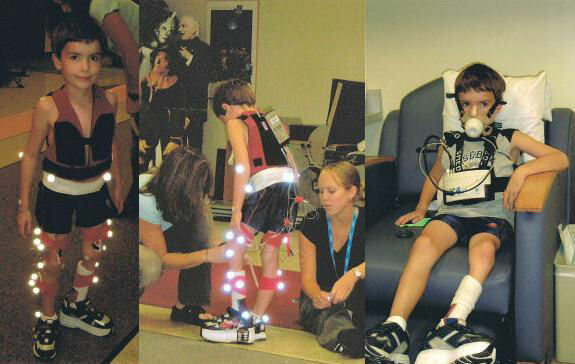 Gradually, Billy was able to walk more, until he weaned out of the wheelchair at school. It was an interesting ride, but ultimately the foot looks great, his toes are actually all side by side, something we haven't seen in quite a while. We found out that his leg discrepancy is now up to about 6cm, and what we didn't expect is just how rotated his leg looks now that his foot is flat. We KNEW in theory how bad it was, but it didn't show as much with the flexed foot. Top view before and after, look at how squished those bones were when he stood before! This top incision behaved nicely the whole time! LLD Clinic update - In December, we went to our LLD clinic and the doctor there has decided it's time for us to think about when we want to schedule Billy's leg lengthening surgery. It can be any time in the next year, but we need to decide when it works best for us as a family. He said that he will not lengthen Billy more than 5cm at a time (2") due to his lack of leg muscle, compromised bloodflow and anticipated slow healing, and that he'd rather do two smaller lengthenings to be safe than risk one longer one. After the fiasco with the foot healing last summer, this makes a LOT of sense to me. We opted to do it the week after Christmas, to allow the most intense parts to take place during this last year of middle school, when we have a known team who can work with us to get Billy's accommodations in school rather than have to face the potential of needing to work with an unknown team in the middle school next year.